Enter a Default Email address for RowStat to use when you email RowStat data. Press Save to save the Default Email address. Press Email RowStat Data to email the RowStat data file. A screen will come up from which you can choose which email application to use (examples: Gmail, Google Docs, GDrive, Yahoo! Mail). Your phone will display all Apps that support CSV (Comma Separated Values) file format. Some of the Apps are not appropriate to export CSV data from RowStat Lite to, this is an exercise for the user. We provide instructions for Google Drive and Dropback services. 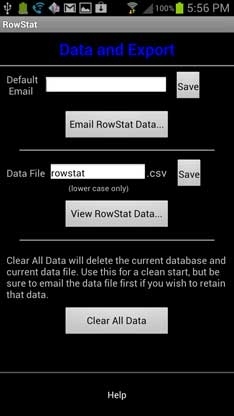 If you would like multiple RowStat data files on your phone, you must change the data file name between sessions. Otherwise, the default name, rowstat.csv, will be used for all sessions. Press Save to save the new data file name. Press Clear All Data to clear RowStat data and start fresh. If you want to save the data recorded before pressing Clear All Data be sure to email or otherwise save the RowStat data file before doing this. The confirmation popup is provided to help prevent inadvertent data deletion.